After using the online demo of CALCMENU, you decided that it is the recipe management solution you needed and decided to buy CALCMENU. EGS sends you CALCMENU in DVD form together with the user manual. You install CALCMENU in your computer but, you are confused as to where to start. Here I will explain how to go about in starting to use CALCMENU. First, you need to configure your CALCMENU. Go to Configuration> Options and Preferences. This is where you set up the basic information you will use in the CALCMENU program itself and in managing your recipes. The Options dialog box displays the several information that you can configure. You can define your preferences for the general and default information, nutrients, picture, currency, import and contact. Define all the information that you will use in CALCMENU. For example, if you are using English as the language of the program, then select English in the General tab. Metric or Imperial?If you want to use kilograms, grams, liter as recipe units, select Show metric units (CALCMENU has predefined units). You can also choose the Show imperial units option if you want to use units such as ounce, pound, and pint instead. If you want to use Metric and Imperial units, then click the Show both options. It’s that easy! CALCMENU gives you the freedom to choose which units to use in your merchandise, recipes and menus. If you want the nutrient values for Energy, Protein and Carbohydrates in recipes, select these nutrients in the Nutrient tab. 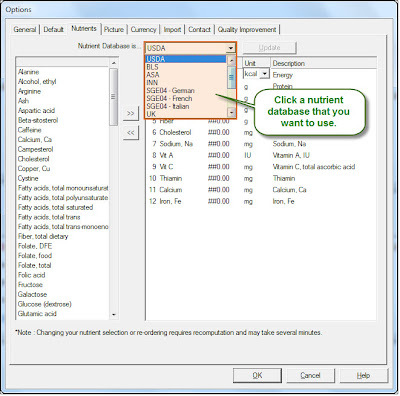 You can select several nutrients to use among the different databases available in CALCMENU such as USDA, ASA and BLS. These nutrient database are free for you to use. Just click on each tab of the Options dialog box and see the options available to you which you can configure. It’s easy, convenient and user-friendly. You can go back to the Options dialog box if you want to modify your previous configuration. After you’re done with defining your preferences, don’t forget to click OK. In Part 2, we’ll talk about managing units, categories, keywords and other items used in CALCMENU.